Size: 33 In. -or- 39 In. Angle up side rails help retain mattress. Dual gravity locks ensure position stability. Torsion Spring-loaded Activation Bar assures that bar is locked in position. Rounded corners for safety. Features: • Helically suspended poly deck. • Height: 15-1/4 In. elevated; 4-1/2 In. collapsed. • Size: 38-1/2 In. x 72 In. • Sturdy construction designed for maximum strength and safety. • Dual 3/4 In. x 3/4 In. cross bars for added center support. Note: 39 In. uses regular size mattress. (Most common selling size). 33 In. uses special size mattress. If you need more sleeping space but do not have the room, try this trundle pop-up. 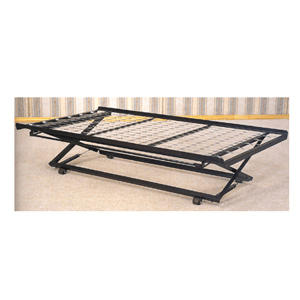 Ideal for use under a twin-sized bed or daybed; supports a twin-sized mattress can be used as a second bed by rolling the unit out and raising it up to normal bed height of 15-1/2 In. Store under a bed in the down position at a height of 5-3/8 In. Rollers for easy storage. Sturdy angle iron poly-deck construction. Includes 1-year manufacturers warranty. Measures: 72 x 40-3/8x5-3/8 In.H in. 300 lbs. weight limit. Made in The USA.